On November 30, the PESA Emerging Leaders Committee hosted its bimonthly leadership forum with PESA Board Member Dave Warren, President & CEO, Energy Alloys. Leadership forums allow member company high performers to interact with industry executives through open dialogue structured around a targeted theme. In this forum, Warren shared his thoughts on the psychology of recovery. Companies have survived downswings before, Warren said, given that the industry is cyclical in nature. He discussed transitioning his company’s mindset from a scarcity mentality to a growth and abundance mentality to capitalize on future opportunities. 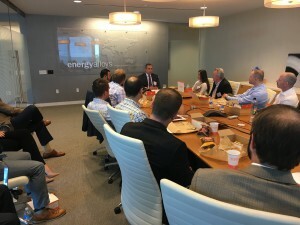 He spoke about how to lead an organization through the slow times to prepare them for the next period of prosperity by aligning the organization for long-term success. Hiring the right people, releasing people with a mercenary attitude, and retaining people with a “patriot” mentality is key. Patriots will align and flex to do what the organization needs. “Leadership is creating a vision with the absence of complete information. Spreadsheets and models can only go so far. At some point, a leader must realize what the data says, see the gaps, pick a direction that you are convicted with, create a vision for the leadership team that everyone buys into, then start executing. If you don’t do that, then you are going to be left behind,” Warren said.